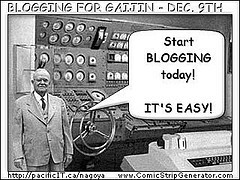 Are you an evaluator and do you blog? If so, the American Evaluation Association wants to hear from you. This CENSEMaking post features an appeal to those who evaluate, blog and want to share their tips and tricks for helping create a better, stronger KT system. Knowledge translation in 2011 is a lot different than it was before we had social media, the Internet and direct-to-consumer publishing tools. We now have the opportunity to communicate directly to an audience and share our insights in ways that go beyond just technical reports and peer-reviewed publications, but closer to sharing our tacit knowledge. Blogs have become a powerful medium for doing this. I’ve been blogging for a couple of years and quite enjoy it. As an evaluator, designer, researcher and health promoter I find it allows me to take different ideas and explore them in ways that more established media do not. I don’t need to have the idea perfect, or fully formed, or relevant to a narrow audience. I don’t need to worry about what my peers think or my editor, because I serve as the peer review, editor and publisher all at the same time. I originally started blogging to share ideas with students and colleagues — just small things about the strange blend of topics I engage in that many don’t know about or understand or wanted to know more of. Concepts like complexity, design thinking, developmental evaluation, and health promotion can get kind of fuzzy or opaque for those outside of those various fields. Blogs enable us to reach directly to an audience and provide a means of adaptive feedback on ideas that are novel. Using the comments, visit statistics, and direct messages sent to me from readers, I can gain some sense of what ideas are being taken up with people and which one’s resonate. That enables me to tailor my messages and amplify those parts that are of greater utility to a reader, thus increasing the likelihood that a message will be taken up. For CENSEMaking, the purpose is more self-motivated writing rather than trying to assess the “best” messages for the audience, however I have a series of other blogs that I use for projects as a KT tool. These are, in many cases, secured and by invitation only to the project team and stakeholders, but still look and feel like any normal blog. WordPress (this site) and Posterous are my favorite blogging platforms. As a KT tool, blogs are becoming more widely used. Sites like Research Blogging are large aggregations of blogs on research topics. Others, like this one, are designed for certain audiences and topics — even KT itself, like the KTExchange from the Research Into Action Action initiative at the University of Texas and MobilizeThis! from the Research Impact Knowledge Mobilization group at York University. The American Evaluation Association has an interesting blog initiative led by AEA’s Executive Director Susan Kistler called AEA365, which is a tip-a-day blog for evaluators looking to learn more about who and what is happening in their field. A couple of years ago I contributed a post on using information technology and evaluation and was delighted at the response it received. So it reaches people. It’s for this reason that AEA is calling out to evaluation bloggers to contribute to the AEA365 blog with recommendations and examples for how blogging can be used for communications and KT. AEA365 aims to create small-bite pockets of information that are easily digestible by its audience. If you are interested in contributing, the template for the blog is below, with my upcoming contribution to the AEA365 blog posted below that. By embracing social media and the power to share ideas directly (and done so responsibly), we have a chance to come closer to realizing the KT dream of putting more effective, useful knowledge into the hands of those that can use it faster and engage those who are most interested and able to use that information more efficiently and humanely. Interested in submitting a post to the AEA365 blog? Contact the AEA365 curators at aea365@eval.org. Remember – stay under 450 words total please! Rad Resource – [CENSEMaking]: CENSEMaking is a play on the name of my research and design studio consultancy and on the concept of sensemaking, something evaluators help with all the time. CENSEMaking focuses on the interplay of systems and design thinking, health promotion and evaluation and weaves together ideas I find in current social issues, reflections on my practice as well as the evidence used to inform it. I aspire to post on CENSEMaking 2-3 times per week, although because it is done in a short-essay format, find the time can be a challenge. What is Developmental Evaluation? This post came from a meeting of working group with Michael Quinn Patton and was fun to write because the original exercise that led to the content (described in the post) was so fun to do. It also provided an answer to a question I get asked all the time. Visualizing Evaluation and Feedback. I believe that the better we can visualize complexity the more feedback we provide, the greater the opportunities we have for engaging others, and more evaluations will be utilized. This post was designed to provoke thinking about visualization and illustrate how its been creatively used to present complex data in interesting and accessible ways. My colleague and CENSE partner Andrea Yip has tried to do this with a visually oriented blog on health promoting design, which provides some other creative examples of ways to make ideas more appealing and data feel simpler. Developmental Design and Human Services. Creating this post has sparked an entire line of inquiry for me on bridging DE and design that has since become a major focus for my work. This post became the first step in a larger journey. Lessons Learned – why I blog: CENSEMaking originally served as an informal means of sharing my practice reflections with students and colleagues, but has since grown to serve as a tool for knowledge translation to a broader professional and lay audience. I aim to bridge the sometimes foggy world that things like evaluation inhabit — particularly developmental evaluation – and the lived world of people whom evaluation serves. Lessons Learned: Blogging is a fun way to explore your own thinking about evaluation and make friends along the way. I never expected to meet so many interesting people because they reached out after reading a blog post of mine or made a link to something I wrote. This has also led me to learn about so many other great bloggers, too. Give a little, get a lot in return and don’t try and make it perfect. Make it fun and authentic and that will do.